Champions Cup rugby was the seasonal goal for Connacht. They can now tick it off. For the first time in the history of the European campaign, Connacht have qualified on their own merit for this elite competition. It is a huge achievement for the province which until last season could only qualify by finishing above one of the other provinces. But the change to meritocracy in the Pro 12 has provided Connacht with real incentive, and they have revelled in the challenge under Pat Lam. Nor can Connacht forget the IRFU's decision to give financial parity to the province, it is now reaping the benefits. Last season Connacht lost out on Champions Cup rugby after a seventh place-play-off against Gloucester; this year they have rubber-stamped their place with two games still to play. It ensures Connacht could now crown their season with a semi-final and a final - a bonus, yes - but it would very much be a deserved reward - there is no dispute Connacht have been the team of this season's Pro 12. On Saturday in the Galway Sportsground they confirmed their superiority with a 35-14 win over Munster - yet another milestone as the double over Munster was completed this season for the first time. Historically Munster, like the other provinces, have loved nothing better than to keep Connacht in their place, but on this occasion they were unable to quell Connacht's thirst for attacking rugby, skilful application, and a growing mental strength. “This team is really growing and maturing as individuals and as a group,” said coach Pat Lam. "We talked about the mental application to not switch off, to put the foot on the throat there. Even at the end, with five minutes to go the game was won. We turned the ball over, we weren’t going to give up and you could see the body language on the guys. “I’m extremely proud. The big goal was to get Champions Cup and it’s just such a massive, massive achievement for Connacht to get there. That’s ticked off now and last week I said one game, we’ve done that. "There’s a few sore bodies, we have to regroup. The challenge is to go to Treviso, where everyone expects us to win, and show we’re real contenders by the way we play. If we do that, we guarantee ourselves a semi-final and then we come back here and I’m imagining that’s going to be massive [against Glasgow]." In a season of highlights, Saturday's victory over fellow province Munster was right up there - the first back-to-back, the match that secured Champions Cup rugby, and, importantly, it was at home for the sell-out 7,800 faithful to savour. 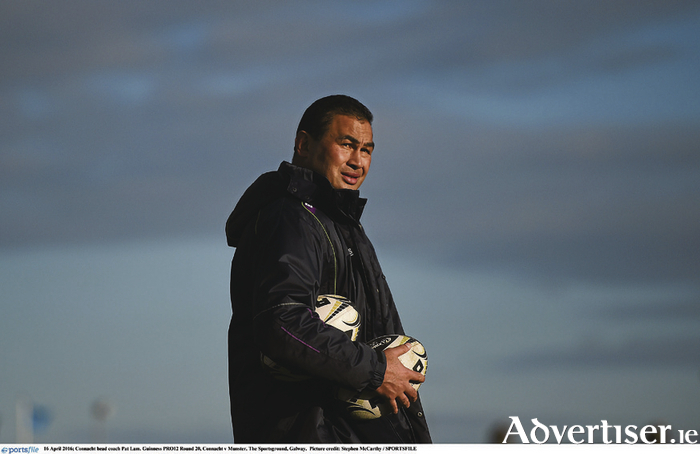 “I’m really pleased for Connacht people,” said Lam,"I am pleased for Eric Elwood. He’s an example, he’s so proud, he’s a reflection of all those who deserve this, what the boys are doing. “When you see a crowd like that and the atmosphere, but it’s not just tonight, you see the Connacht gear everywhere now." It should have come as little surprise that Connacht's attacking prowess would be able to condemn Munster to the qualification scrap which previously has been Connacht's domain. It took some time before Connacht swung into gear - Munster's opening showing hunger with a 14-6 lead courtesy of tries from Simon Zebo and Mike Sherry. Page generated in 0.0633 seconds.